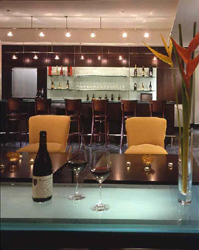 Miami Beach 411 : Restaurants : VINO Miami : Wine Bar and Retail Boutique in Miami Beach, FL. For info call 1-786-207-8466. This page allows you to find Menus, Customer Reviews and Online Reservations for Vino Miami in Miami Beach. About: VINO Miami is a chic, elegant wine bar and retail wine boutique. The menu features boutique wines and champagne by the glass or bottle, and gourmet light fare. Bring your Visitor Pass and save 15%. Learn more. Vino Miami is located at 1601 Washington Place in Miami Beach FL, 33139. Nearby restaurants include: Escopazzo, Cafe Des Arts, and Sum Yum Gai. Use our Miami restaurant map to find the exact location.